The March meeting of the Wargrave Local History Society began with the AGM, when the past year's activities were reviewed, the committee for the coming year elected, and details of the 2010-11 programme given to members. For the rest of the evening, the Chairman and Secretary, Peter Halman and Peter Delaney, recounted the discovery of a set of 3 photograph albums of photographs of Wargrave. At the AGM of 2009, 2 WLHS members had brought along 2 loose samples from the albums. The pictures were interesting, and looked early - possibly about 1900, as one pre-dated the building of the Woodclyffe Hall. We were asked if we 'would be interested to see the albums'. This was duly arranged, with a comment that 'maybe we would be able to identify who the owner was by comparing the initials on the front with all the people listed on the village census'. The pictures included many village scenes, but also from further afield -- not only surrounding towns and villages, but Herefordshire, Scotland, Romsey Abbey and Embley in Hampshire, as well as the Channel Islands and mainland Europe. Part way through the second album were two views of the interior of a Wargrave house - and then the relevance of the initials HCS on the front of the albums became clear - Harriette Cooke Smith - benefactress to Wargrave of all the Woodclyffe amenities in the village and more. The relevance of many of the pictures then became apparent. 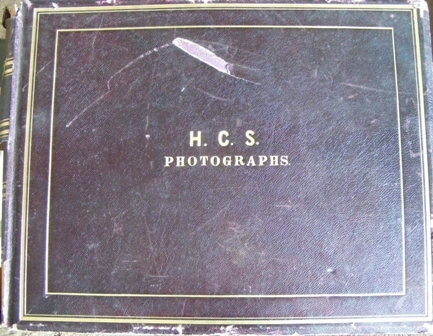 One of the interior shots even includes the first of the photograph albums on the table! Further pictures include several of Harriette and William Smith, whilst the captions to others tell us that some of the views date from the 1870s - probably some of the earliest photographs of the village. The albums have now been acquired for the Wargrave Local History Society archive, giving an interesting glimpse of the village in the mid to late 19th century, and a selection of the images were used to illustrate the presentation. Further information about this find can be found here. The next meeting will be on Tuesday, April 13th, when Maureen Fennemore and Judi Rowlands will give us an insight into "How to source and prepare costumes for Wargrave Theatre Workshop productions". Then on the afternoon of Tuesday, April 27th, Stephen Loyd will lead members through Ruscombe Wood to discover the flora in this protected woodland, whilst the following meeting is on Tuesday, May 11th, when Geoff Horsnell will tell us about Shiplake Lock, and his role as a lock-keeper there.